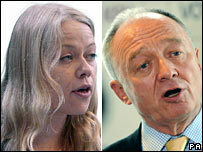 Green Party London mayoral candidate Sian Berry has urged her backers to give their second preference votes to current mayor Ken Livingstone. Mr Livingstone has said he will also give his second vote to Ms Berry, as they launch five joint "green" pledges. Both say Tory candidate Boris Johnson "cannot be trusted" with green issues. Mr Johnson said it was "arrogant" of the mayor to tell people "how to vote" and said he would be publishing his own environment manifesto soon. If none of the candidates gets more than 50% of votes at the first count, all but the top two candidates are knocked out and their second preference votes shared out. In the previous two London mayoral elections, Mr Livingstone had to go to the second round to secure victory. Ms Berry's decision to ask her voters to back the mayor was approved at a meeting of Green Party members on Monday. She said she "could not bear" the idea of Mr Johnson becoming mayor. In a joint statement, she and Mr Livingstone accused the Conservative candidate of opposing the Kyoto Treaty and opposing plans for a £25 congestion charge for the least efficient cars. "Tackling climate change and creating a fairer London must be at the top of any serious mayor's agenda," they said. "London, with a committed mayor and Green Party representation on its assembly, has taken a global lead on environmental and social justice over the last eight years. Let's keep it that way." They will launch five commitments later - the £25-a-day charge on "gas guzzlers", no reduction in the congestion charge zone, extending the low emission zone to cover lorries over 3.5 tonnes - and eventually vans - opposition to further airport expansion and a target of 50% of new homes to be affordable. Mr Johnson has said he would "reform" the congestion charge, arguing congestion is worse now than it was when it was introduced - he argues the £25 charge is "a stick with which to beat motorists" and will hit families and small businesses. But Mr Johnson said Mr Livingstone was "out of touch and arrogant" to think he could tell people how to vote. "Londoners will make up their own minds based on the policies put forward by all candidates," he said. "I have already published manifestos on crime, transport and housing and will be launching my environment manifesto shortly, which will include a number of fresh and innovative ideas for making the capital cleaner and greener. " Mr Johnson said Mr Livingstone should publish some policies accusing him of running out of ideas and borrowing his own. Liberal Democrat mayoral candidate Brian Paddick said his party was committed to making London Europe's "greenest" capital. "Anybody can exploit green issues for political purposes but the independent assessments of solutions to tackling climate change show the Liberal Democrats are the only party to have proposals that work," he said. Earlier Mr Johnson said he would "name and shame" London boroughs which do not use powers to crack down on alcohol-fuelled violence. He said violent offences were up since Mr Livingstone became mayor and drink was a factor in 40% of them. "We need to tackle the problem at its core and get tough with bars and shops that break the rules," he said. "We must make alcohol harder to buy for under-18s in order to tackle the problem of underage drinking and deal with alcohol related violence." Meanwhile Electoral Commission chief executive Peter Wardle has disclosed the watchdog is investigating a form calling for donations to Mr Livingstone's campaign. He told the Commons Justice Committee on Tuesday he was "looking into" claims the form gave the impression money was going to the mayor's campaign, when it was in fact going to the Labour Party.